Dutch land artist Will Beckers -- aka The Willowman -- creates magical site-specific installations that explore our relationship with the natural world. He uses living natural materials and thinks of himself as a "part-time artist", as his art is always finished by Nature itself. 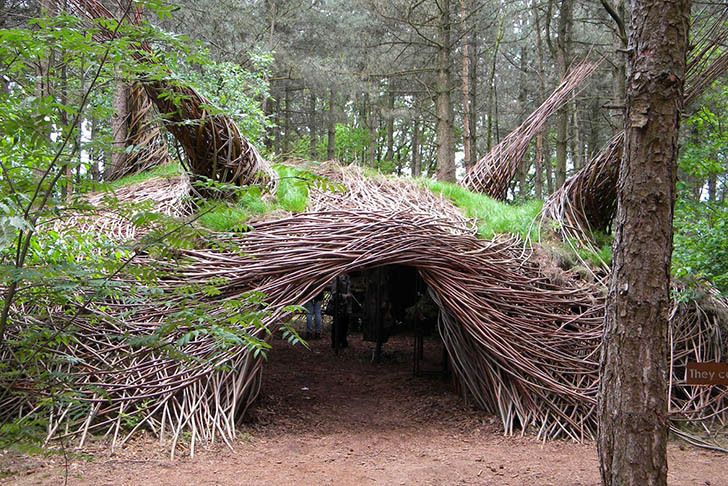 His whimsical sculptures are made for people to enjoy but also serve as shelters for woodland animals and insects. Will Beckers (known as The Willowman) creates stunning, ephemeral, site-specific sculptures made from re-used local materials. He started out working with clay but now incorporates a variety of natural materials into his work, and has mastered the art of willow weaving. By twisting, turning, and weaving the dried flexible plant‘s branches, he creates whimsical sculptures in magical surroundings. The Dutch artist’s works can be found in public spaces around Belgium and The Netherlands, including the most recent Floriade floral and gardening exhibition. He often invites children to join in and experience the pieces, as well as the enchanting natural surroundings he places them in. Taking inspiration from the way birds build their nests, each stunning natural sculpture is “dedicated to all creatures that fly in its vicinity”. The Willowman's creations are site-specific sculptures made from re-organized local materials. He started out working with clay but has now incorporated a variety of natural materials. By twisting, turning, and weaving the dried flexible plant's branches, he creates whimsical sculptures in magical surroundings. The Dutch artist works can be found in public spaces particularly around Belgium and The Netherlands, including Floriade's latest exhibition. He usually invites children to join in and experience the pieces, as well as their enchanted natural surroundings. Taking inspiration from the way birds build their nests, each stunning natural sculpture is "dedicated to all creatures that fly in its vicinity”.